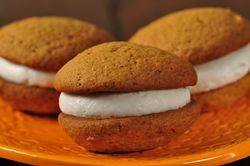 Pumpkin Whoopie Pies take two round, domed shaped pumpkin flavored cookies and sandwiches them together with a soft and creamy vanilla filling. The Whoopie Pie's origin is not clear, but they originated either in the Amish country of Pennsylvania or from New England. Although we may never know who or how someone came up with these delicious cookies, the story is that one day a creative cook had leftover cake batter and decided to make large round cookies with it. When they turned out, the cook was heard to say "Whoopie!" "Pies.". They are called "Pies", because at one time cakes were once baked in pie tins, so the two names often became interchangeable. Whoopie Pies come in a variety of flavors, chocolate, vanilla, molasses, peanut butter, and pumpkin. While chocolate is one of my favorites, so are these Pumpkin Whoopie Pies. These cookies are wonderfully moist, soft and cake-like with a buttery pumpkin flavor. The recipe is one I adapted from "Cook What You Love" by Bob and Melinda Blanchard. However, the filling recipe is one I adapted from Wayne Harley Brachman's enjoyable book "American Desserts". This frosting has a nice vanilla flavor and is soft and creamy (like marshmallow cream) because of the addition of shortening and corn syrup. If you do not want to use shortening you can replace it with an equal amount of butter. These cookies would be nice served after a Fall or Winter meal and would also make a pleasant surprise at Thanksgiving. To make our lives easier instead of making our own pumpkin puree we can buy canned pure pumpkin. Just make sure you do not buy the pumpkin which already has the spices added to it. However, if you want to make your own puree start by using the smaller pumpkin varieties like Sugar Pie, Baby Bear or Cheese Pumpkin (approximately 5-7 lbs., 2 1/2 - 3 1/2 kg.). Then first cut the pumpkin in half lengthwise, remove all the seeds and stringy fibers, and then place cut-side down on a greased baking sheet. Bake at 350 degrees F (177 degrees C) for approximately 45 minutes to 1 1/4 hours (depending on size) or until easily pierced with a knife. Scoop out the pulp and puree in a food processor until smooth. You do need to extract all the liquid, so strain the pumpkin through a cheesecloth lined strainer and then cool the puree before using. Pumpkin Cookies: Preheat oven to 350 degrees F (180 degrees C). Lightly butter two baking sheets or line them with parchment paper. In a large bowl whisk together the flour, baking powder, baking soda, ground cinnamon, ground ginger, ground cloves, and salt. In the bowl of your electric mixer, fitted with the paddle attachment (can use a hand mixer), beat the butter and sugar until light and fluffy. Add the eggs, one at a time, beating well after each addition. Scrape down the sides of the bowl as needed. Beat in the vanilla extract and pumpkin puree. Beat in the flour mixture just until incorporated. Drop heaping tablespoons (can also use a small ice cream scoop) of the batter onto the prepared baking sheet, spacing about 2 inches (5 cm) apart. With moistened fingers or with the back of a spoon, smooth the tops of the cookies. Bake for about 10 - 12 minutes or until the tops of the cookies spring back, when lightly pressed. Remove from oven and transfer to a wire rack to cool completely. Filling: Beat the shortening and butter until soft and creamy. With the mixer on low speed, gradually beat in the confectioners' sugar. Increase the speed to high, and beat until light and fluffy, about 3 minutes. Then, with the mixer on low speed, beat in the vanilla extract and slowly drizzle in the corn syrup. Continue to beat until the filling is soft and fluffy. To Assemble: Take one cookie and spread (or pipe) a heaping tablespoon of the filling on the flat side of the cookie. Top with another cookie. The assembled cookies can be covered and stored in the refrigerator for several days. Enjoy cold or at room temperature. Makes about 24 Pumpkin Whoopie Pies. Note: This recipe can be halved to make 12 Pumpkin Whoopie Pies.